Impressive battery chainsaw. GreenWorks 80V (GLM801600). Let’s be honest, we’re not all lumberjacks, born with an axe and chainsaw from birth. Most homeowners need to be guided on how to cut down a tree. There are a lot of things to consider, which is why we’ve put together this tree feeling guide — just for you. Note: Before felling a tree makes sure you check with your local bylaws as in many towns and cities of the world you need a permit. Please check before cutting down a tree. Have you ever seen a video of someone attempting to cut down a tree only to have it fall in the wrong direction, usually landing right atop of a car or through a house? Many of us have seen this and it’s an all-too common occurrence among those who are inexperienced or improperly trained on how to safely and correctly cut down a tree. If you’re not comfortable or experienced with a chainsaw hire a professional. Tree cutting, which is also referred to as felling a tree, is a rather dangerous task. You might think this is common knowledge but based on the statistics there are still hundreds of chainsaw-related injuries seen in emergency rooms every year while felling a tree. There is a right way and (many) wrong ways to cut down a tree. There’s much more to it than simply taking a chainsaw to a tree and hoping for the best. If you want the job done right with minimal risk of injury or property damage this guide will inform you on how to cut down a tree properly and what measures need to be taken to ensure safety. A convenient kit to protect your head and face. Tree felling can be very hard on the eyes and ears. Safety goggles or a visor will protect against flying chips from getting into your eyes. Another concern for safety is falling limbs while cutting, so a hard hat is a must. The Husqvarna ProForest Chainsaw Helmet System is a safe bet to go with for the value as it combines a helmet, safety visor and hearing protection all in one. Kevlar chaps or chainsaw pants are protective leg coverings made with a special type of material to reduce injury upon impact from the chainsaw should it happen to slip. You can usually find these at hardware stores and retailers that sell chainsaws. Or, consider buying the full package with the Husqvarna Chainsaw Protective Apparel Powerkit (531307180). Yes, it’s a mouthful if you say it out loud. I don’t recommend it. Everything you need — except the chainsaw. Ask any professional about the best way how to cut a tree down and they will most likely tell you it starts with a good quality saw that has a sharp chain. Husqvarna is a very popular brand for high quality chainsaws with long-lasting durability from light duty to heavy-duty performance. The ax can serve multiple purposes for the job from creating a notch, marking the tree for the back cut, or driving the felling wedges. It can also be used as an alternative to a chainsaw, depending on the size of the tree and your endurance. Inexpensive and essential to felling a tree safely. When you’re making the back cut of a tree, it may tend to rock back just before it proceeds to fall. The use of tree wedges will help protect your chainsaw from binding during the cut should this occur. Aluminum or plastic wedges will reinforce the tree to fall in the right direction as well as protect your chainsaw. If the tree tends to lean in a direction that is not ideal for falling you will need to use a strong, sturdy cable to help pull it towards the direction you need it to fall. Accidents can happen in the blink of an eye. Always use caution and have a first aid kit handy in the event it becomes needed for medical attention. If you are attempting to cut down a particularly difficult tree such as one that is very thick or consists of a double trunk, your average everyday chainsaw may not be sufficient. The greater the effort it takes to fell a difficult tree the faster you will become fatigued and this can result in injury or pose a serious risk. Use a chainsaw that is right for the job and your handling capability for greater efficiency. Lightweight & affordable. A good beginner gas chainsaw. A gas-powered chainsaw is typically the preferred choice as these operate faster, smoother, and require less pressure to be applied while cutting than electric chainsaws. They’re also heavier and louder to operate, though. These chainsaws require regular maintenance to keep them running properly. 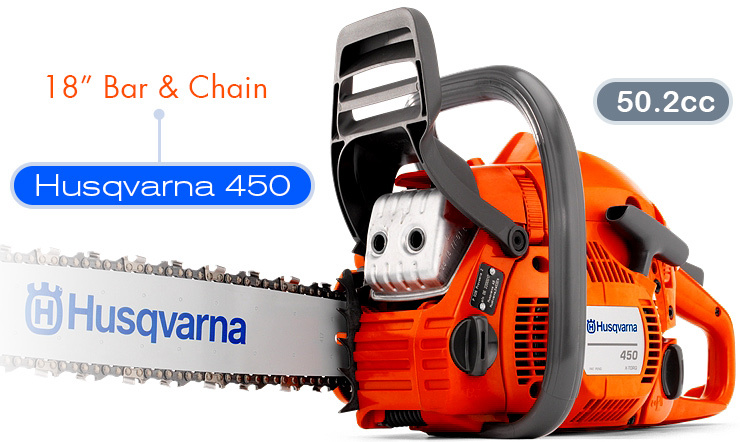 A new homeowner that has just a few small trees around the yard that need to go would do well with the Husqvarna 435 16-inch gas powered chain saw. It has several convenient features to offer such as a combined start/stop switch that make starting and operating the engine a breeze. Other features that make this chainsaw a great model to work with are the ergonomic handle and trigger; plus it only weighs just a little over 9 pounds – fairly light for a gas-power. A classic chainsaw. A great chainsaw for tree felling. The Husqvarna 450 is a recommended choice for average landowners with domestic tree cutting jobs. The 3.2 horsepower engine delivers sufficient power to handle medium-duty tasks. It is equipped with several convenient features for ease of use and smooth operation like LowVib vibration dampening, SmartStart technology, and a lightweight frame that puts minimal strain on the user. It also features an X-Torq engine that reduces the fuel consumption it requires to operate. The Husqvarna 460 Rancher would be the heavy-duty model in the lineup of ones to go with for larger, denser trees. Its 20-inch bar is slightly larger than average. It is additionally matched by robust features like a forged 3-piece crankshaft that adds durability and reliability. Husqvarna chainsaws are consistently great. Just ask their customers. The Remington RMS 51518R Rodeo chainsaw is good buy for the value for those on a budget and it also has the power of a heavy-duty chainsaw to take on bigger trees. Equipped with a 51cc 2-Cycle engine this machine is suitable for those tough jobs around the yard. As an added safety measure, this unit much like many other models features a chain brake on it that will stop the movement of the chain if it senses a kickback. Made with a die-cast chassis. Built tough, but a little heavy. These chainsaws are generally smaller and lighter to hold than gas-powered chainsaws and do not require refueling or regular maintenance. They also don’t emit toxic fumes. 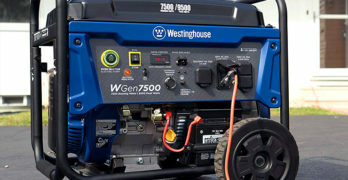 These have a slower sawing speed than gas, however, and are more suited for lighter duty tasks such as small trees and trimming branches. The Makita UC4051A is a 16-inch corded electric saw that offers heavy-duty performance with a chain speed of 2,900 FPM for fast cutting operation. It also features an automatic chain oiler as well as a view window on the oil reservoir for continuous operation and convenience. If you go with a corded electric chainsaw to fell a tree, you will need to use a weather-resistant heavy duty extension cord and be sure the power cable is clear from your escape route. Professional electric chainsaw that rivals a small gas chainsaw in ability. 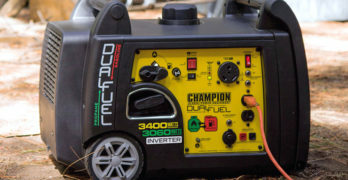 If you want to opt for a battery-run chainsaw instead, there’s a well-known company that manufactures a variety of battery operated power tools with interchangeable batteries. In fact, the GreenWorks GCS80420 80V is one such model that delivers the power and performance that can be matched with a gas-powered engine. All of the GreenWorks models, like this one, feature a DigiPro Brushless motor to compare with commercial-grade quality chainsaws. As powerful as a 45cc gas chainsaw. Yup, and it’s powered by a battery. Before you actually set to begin cutting down a tree with a chainsaw there are a few necessary steps you must take. First, you will need to determine the direction the tree will fall. The best way to go about this is to analyze the tree. Examining the tree – Gravitational pull will be your friend if you work in favor of it so examine the tree to see if it leans more in one direction. Notice if there are any branches that may be dead or broken. You will want to avoid standing beneath any limbs that could come loose while cutting the tree. Also factor in the wind direction as this plays an important role in the direction the tree will potentially fall. Ideally, you want to cut down a tree in the direction it favors but you should also never try tree felling against the wind, at least not without proper precautions set in place. Clear the drop zone – you certainly wouldn’t want a tree to take out your vehicle or your home so be sure when analyzing it to get a good estimate of it’s size and how much clearing space it will need. Observe the area and be sure there is nothing in its path that can become damaged such as your house, a shed, a vehicle, etc. Also clear away any small brush or obstacles around the area opposite the direction the tree will fall to clear a path to step away quickly. You should have a clear escape route to get as far away from the tree as possible if it shifts direction and doesn’t fall as planned. Use the long rope or chains to pull the tree towards the direction you want it to fall as you drive the wedge into the tree. Secure a strap around the base of the tree above where you intend to make the cut to prevent the tree from splitting. Make a Notch – You will need to make a horizontal cut to create a notch in the tree in the direction you want it to fall. As the tree’s diameter is wider than your chainsaw this will help guide the tree to fall in the desired direction as you make the back cut. This can be done with an ax or chainsaw and should be cut square to create a hinge for the tree as it falls. Make the cut approximately 18-20 inches from the ground (no higher than your hip) at a right angle. The cut should be made ¼ of the diameter of the tree or up to ⅓ of the diameter but no deeper. Make another cut into the notch above your first cut, at a 45-degree angle to cut out all of the wood for a clear hinge. The back cut that you make, which will fell the tree, needs to be done towards the direction of your notch. A good guideline to ensure an accurate cut is to circle the tree starting from above your notch using a slow-running chainsaw to create a mark. Proceed to make your initial cut into the tree making sure you are sawing in the direction towards the fall. Take your time and proceed with caution. Once you get past the depth of the saw’s bar, begin driving your wedge into the cut. Do this by tapping it with the back of an ax, continuing as the cut deepens, without forcing it into the wood. As your back cut gets within a few inches from the notch you made stop cutting. You should notice the cut beginning to open at this point. You don’t want to saw all the way through the tree to your notch as this will cause the tree to free-fall and that could spell disaster. Instead, continue to drive your wedges carefully to make the tree begin falling. Listen for the creaking and snapping sounds as the tree is about to start falling and step back quickly a safe distance from the tree. Tree felling is risky business and should not be taken lightly. You will need to have your full focus on what you’re doing to avoid making a fatal mistake. Familiarize yourself with the saw. Take a few practice tries on smaller trees to get more comfortable before taking on a much larger tree. If using a gas-powered chainsaw, make sure it has a full tank of gas and oil. 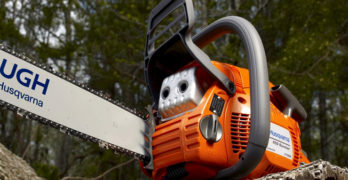 For battery-operated chainsaws be sure it is fully charged before you begin. Secure your footing when making cuts to the tree and be sure you have good traction to avoid slipping. Keep your eye on the tree when you step away from it as it is falling to avoid mishaps. Attempt to fell a tree while fatigued, intoxicated, or unwell. Use a saw that is dull, not working properly, or not sufficient for the job. Wear sandals, or open-toed shoes while working. Don’t do it yourself when you don’t have the right tools, equipment and experience. In this case you should hire a professional. Given this information on how to cut down a tree with a chainsaw, consider the alternative option. Don’t take shortcuts for the sake of saving time and money. Regardless if the tree is large or small in size, safety should always be taken seriously. If you’re trying to save money consider how much would it cost to have a professional cut down a tree and compare that price to the total cost of the job with the equipment and safety gear you’ll need to do it right. Do you have the right saw needed for the job or would you need to purchase a new one? A high quality chainsaw could cost you the same if not more than to just do them yourself. Is it worth it to buy the additional (and necessary) safety gear for on the job? Prices for professional tree cutting service varies by location, size and type of tree, and the number of trees to be cut among other factors as determined by the company. It may range anywhere from a couple hundred dollars to well over a thousand dollars. Also, take into account your confidence in your ability. If the tree you’re needing to cut down is in close proximity to power lines, other houses, or a highway then it’s best to call in the professionals. Call and ask around for pricing from reputable tree cutting companies in your area and do a little research to ensure their credibility. It’s better to be out a few dollars and hire someone with experience and skill than to be sorry later.